We noticed the dogs have been pulling at the moose neck because our game pole is too low, so we decide we will cut the moose into quarters and lift the fronts high enough so the dogs cannot reach. When we checked the meat, it stunk. The neck had started to turn green. We were asking ourselves, "What was going on?" It IS cold enough to hang the meat... so why is it going bad? Our hard earned moose meat was rotting right under our noses, and we didn't know why! And at this point it really did not matter, we just needed to stop the spread. We work fast to cut out the sour bone. We are fortunate it has not spread through the entire animal. We find the sour is concentrated in the front quarters and mostly on the right side. We cut, and discard, we cut more... this is not good! When all is said and done we lost about one quarter. From the right side we salvaged the leg and the left we lost the neck and some ribs. Getting the moose meat into a cool storage unit was our next priority. If you ever need to cut out sour, just follow your nose. Keep cutting until you get rid of the foul smelling meat. Believe me, it is not difficult to tell. The only thing we can figure is that when we left the moose in the bush overnight, it did not cool enough. After cleaning we propped the chest cavity open but failed to turn the moose up onto its sternum. Out of 27 harvested moose we have only left one other moose in the field overnight so our experience here is limited. We now know it is critical to cool the meat better than what we did. 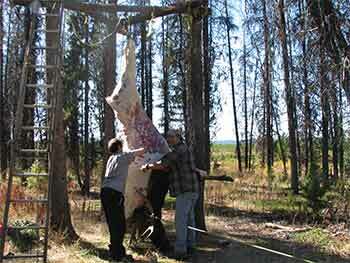 We plan to purchase a chainsaw that will be used only foe quartering moose, instead of chain oil use vegetable oil. We all work very hard to secure our trophy big game animals. It is not a matter of the antlers in our case, we consider all our game trophy class... we are meat hunters. It is a real shame to loose meat to bone sour. This year we went to the school of hard knocks, but we did learn from this experience and we won't ever let it happen again. For future reference make sure you can cool any meat you harvest. If you must leave it in the field, use whatever means available to you to cool your game meat to prevent sour bone. We met some fellows this year that left their moose hanging in camp a little too long. The nights were cool but the days were warm and the meat began to spoil. They got busy and started cutting, eventually losing the entire neck... probably close to 100 pounds. As soon as they finished trimming the bone sour away they packed up the remaining meat and took it to a butcher to hang in his walk in cooler.